Responding to a distress signal on planet Omega IV, Kirk finds Captain Ron Tracey of the U.S.S. Exeter violating the prime directive and interfering in a war between the Yangs and the Kohms to find the secret of their longevity. "The Omega Glory" was first broadcast March 1, 1968, and repeated July 26, 1968. 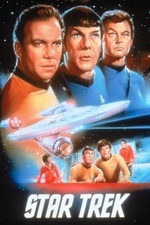 It is episode #52, production #54, written by Gene Roddenberry, and directed by Vincent McEveety. The story was one of three outlines submitted for selection as the second pilot of Star Trek, the others being "Mudd's Women" and "Where No Man Has Gone Before". In this episode, Captain Kirk must find the cure to a deadly disease and put an end to another Starfleet captain's cultural interference. Trek Movie's not so positive review. I had absolutely no memory of having seen this episode before. I can't imagine how I would have managed to skip one back when I first got caught up in Trek fandom back in high school in the 80's, I was so obsessed I used to know when Shatner & Nimoy's birthdays were. But, now that I think about it, I have no idea how I watched the show. It was before DVD - I must have just been watching it in TV syndication? I wasn't recording it on the vcr for myself though (oh, my lords of obsolete technology, auto-correct doesn't recognize vhs or vcr as real words). What an odd episode. I think Trek Movie's review is actually pretty positive, all things considered. Trek Today's is the snarkier one "Because of the last fifteen minutes, "The Omega Glory" must be classed as one of the worst Star Trek episodes ever, but until it falls completely apart, it's rather enjoyable in a campy, superficial way. This is the only episode I can think of where Kirk gets knocked out not once but twice and by both sides of the conflict, and William Shatner plays his scenes with a sour, grumpy expression as if Kirk has a headache throughout, even before the dialogue has degenerated into the nonsense at the end when Kirk attempts to make a case for truth, justice and the American way. Tracey's character is written as so over-the-top crazy that Shatner can emote to his heart's content and Kirk still seems calm and rational." Hee. So HOW name analogues of Earth did they run into? So many that a popular fan theory was that some attached alien race was preserving snippets of various Earth cultures as sociological laboratories. I think this and the Roman planet are the only times they don't explain any particular reason for the similarity. (The book on the gangster planet, the historian on the Nazi planet, the various times that Earth elements are re-created based on human memories.) And with the Roman planet, they try to justify it with appeal to "Hodgkin's Law."